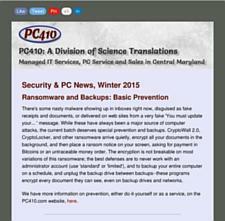 The first issue of PC410 News is available now, and signups are online. 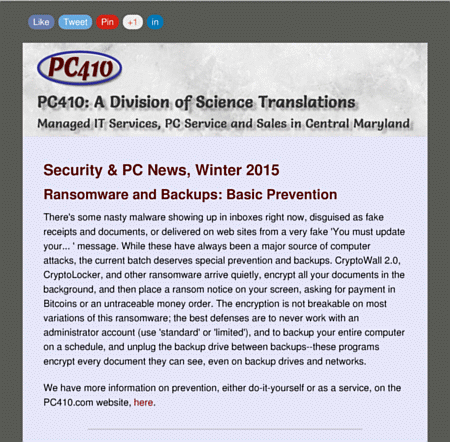 Our first issue has a quick executive summary on Ransomware, plus a free keyboard shortcuts link. The newsletter will be monthly, mostly, with occasional emergency news when the internet threatens business PC systems. It’s short, written for business PC users, with links to more information, and while it’s written for businesses, not technicians, there are links to more information. Sample issue, the future issues archive, and signup are all here. Back Up Your Business, Not Your Computer! How do I maintain my Windows-based computer? How Do I salvage data from my Old, Dead, or Infected PC? If All Software was this Good. Or Evil. My PC had Malware, What’s After the Cleanup? Why buy my computer from a local shop? Sign up for the free PC410 Newsletter! Our new business PC user newsletter is monthly, mostly, with short computer news for business owners. Are you ready to install Windows 10? 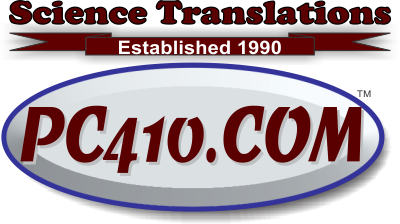 Call Science Translations in Westminster MD for a free estimate on your computer repair, upgrade, virus cleanup, or malware removal. On-site service available in Carroll County, Maryland, and nearby areas, including Reisterstown, Owings Mills, and Baltimore, as well as Finksburg, Lutherville, Towson, Cockeysville, Timonium, Hunt Valley, and Taneytown, MD.